Our daughter loves ketchup, she will eat anything with ketchup on it. But as a mom I feel guilty every time I serve her industrially produced ketchup. They are usually packed with GMO tomatoes, too much sugar and very often high fructose corn syrup. So for quit a while I have wanted to make my own ketchup. I searched the internet for recipes, since I never made it before. The recipes I found were very different from one an other although most of them had a few basic ingredients in common namely vinegar, tomatoes, sugar and mustard/mustard seeds. I went all in, tested and played around with a few recipes until I found a combination of ingredients and preparation to make the most delicious ketchup I’ve ever eaten in my life. Most importantly my daughter could literally eat several spoons of my ketchup. I cut back on the sugar as I found that it was not as necessary and that adding it didn’t really improve the taste to the better. Many times sugar is used to disguise raw, sub-standard materials and I guess that´s why industrial produced ketchup use a lot of it. If you instead use good ingredients you will find that a lot of sugar is not necessary. I used sun dried tomatoes with organic canned tomatoes instead of only using fresh or canned tomatoes, which gives the ketchup a a fuller taste, a more richness in flavor and roundness. I used french dijon instead of mustard seeds to spice it up a bit. 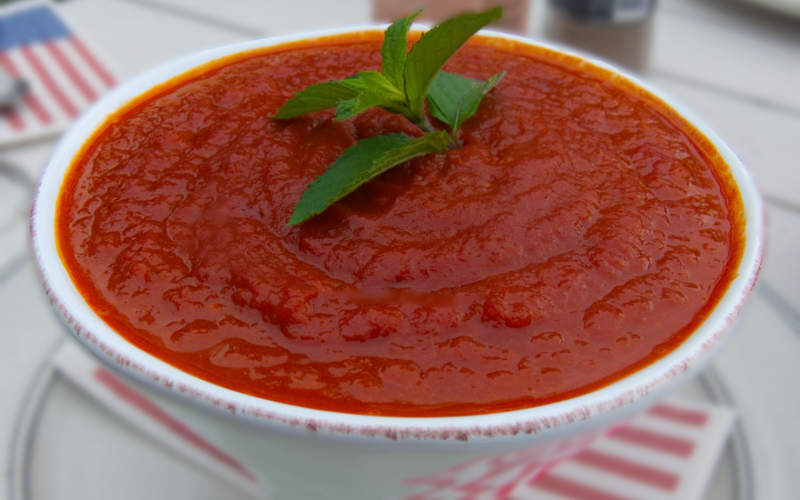 I did not use any herbs or cinnamon as many recipes use, since I don´t want it to be a ”tomato sauce” I want it to be ketchup. I also had in mind, making this ketchup, that it needed to be easy and fast. The end result is made under 15 minutes (most other recipes take over an hour to do). I will never again buy industrial produced ketchup. This is so much better! Every one of you should make this at home tonight! Your ketchup is ready to eat under 15 minutes. However the flavors are richest after the ketchup have been cooled in the fridge for awhile.